The other week as I was strolling the aisles of Trader Joe's I discovered their butternut squash. It is already peeled and chopped for you and is exactly one pound of squash. My friend Andrea had just been telling me about a light macaroni and cheese she had been making with butternut squash so I grabbed the squash and ran home to start cooking! Combine squash, broth, milk, and garlic in a medium saucepan; bring to a boil over medium-high heat. Reduce heat to medium, and simmer until squash is tender when pierced with a fork, about 25 minutes. Remove from heat and pre-heat oven to 375. Shred your cheeses and have them handy...you will need them soon! Put the hot squash mixture in a blender. Add salt, pepper, and Greek yogurt. Remove the center piece of blender lid to ensure steam can escape and secure blender lid on blender. Place a clean towel over opening in blender lid to avoid a big mess. Blend until smooth. Heat oil in a medium skillet over medium heat. Add Panko, and cook for 2 minutes or until golden brown. Remove from heat; stir in remaining 2 tablespoons Parmesan cheese. Sprinkle evenly over the hot pasta mixture. Lightly coat topping with cooking spray. 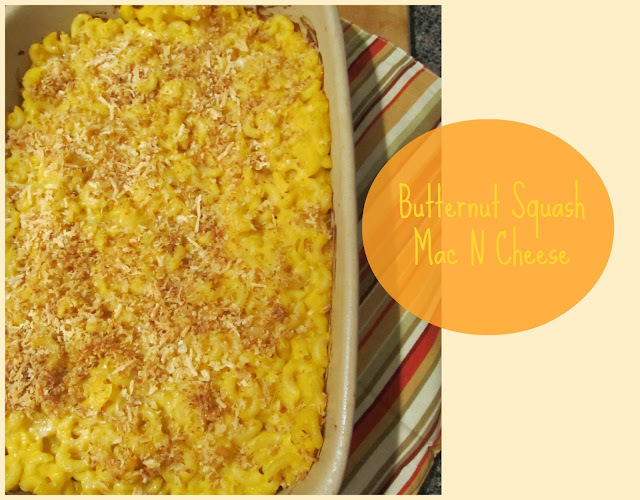 And there you have it: a still delicious, but healthier version of Mac N Cheese! Uhm, this looks delicious! 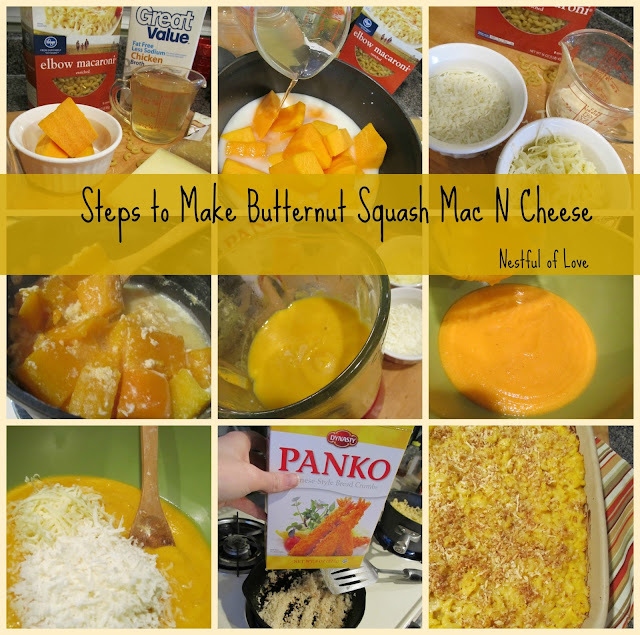 I've never heard of using butternut squash to make mac n cheese. Wow. This is different and really interesting. It also look yummy. I will have to write this recipe down and try it. Thanks! The discovery of that TJ's prepped butternut squash was a good thing in my life too... and this looks great! After wrestling with a butternut squash at home I LOVE the idea of buying it pre-cut! I need to do this...and make this delicious recipe! Looks yummy! I haven't done anything with butternut squash before. I need to try it out!